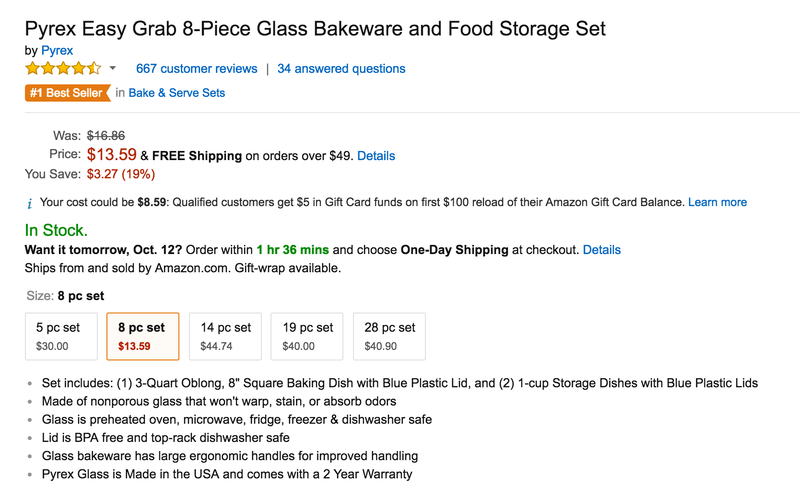 Amazon has the Pyrex Easy Grab 8-Piece Glass Bakeware and Food Storage Set for $13.59 with free shipping for Prime members or in orders over $49. This set regularly sells for $18+ and is currently within $1 or so of the Amazon all-time low. It is one of the best-selling food storage sets on Amazon and carries a 4+ star rating from over 650 customers. Pyrex Easy Grab glassware products feature large handles that give you more ‘grip’ space and make it easier to transport. This line was designed with particular emphasis on comfort, style, and convenience. The Easy Grab series is even easy to handle with oven mitts. Glass is preheated oven, microwave, fridge, freezer and dishwasher safe.